RSVP by 11:59pm Monday to avoid late fees. You may pay online via credit card. Walk-ins without a confirmed standing reservation pay $30 in cash/check at the door. As the UK prepares to leave the EU, Ireland’s Consul General in Texas will discuss how Brexit will impact Ireland, Northern Ireland, the future of Europe, and transatlantic relationships. Consul General Farrell is Ireland’s first Consul General to Texas (and Arkansas, Colorado, Kansas/Kansas City, New Mexico, Louisiana, Oklahoma). The Irish Consulate General was formally opened by Irish Prime Minister in March 2015. Leo Varadkar, Ireland’s new Prime Minister visited Austin in March 2018.
served on the team that opened Ireland’s Embassy in Ankara, Turkey in 1999. He was posted as Press and Information Officer at the Irish Embassy in Berlin, Germany from 2005-2010. 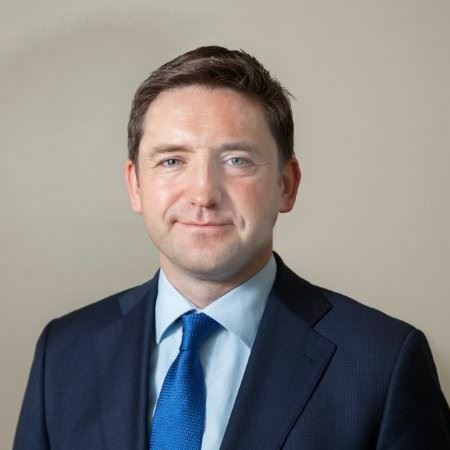 Between postings abroad he worked on the EU policy team in Dublin at the Department of Foreign Affairs and Trade and the Department of the Taoiseach, including during Ireland’s Presidencies of the EU in 2004 and 2013. He was also seconded to the Irish Business and Employers Confederation (Ibec) in 2014. Farrell holds a degree in European Studies and a Higher Diploma in Education from the University of Dublin (Trinity College). 8:30am - Have a wonderful Wednesday!